U.S. Coast Guard photo of the Punta Gorda light in its heyday. Anyone wanting a taste of the Lost Coast -- without backpacking 25 miles from the mouth of the Mattole to Shelter Cove -- can enjoy a fine day's hike to the Punta Gorda light, a seven-mile round trip down the beach from the Mattole parking area. In its time, the Punta Gorda Coast Guard outpost was known as the "Alcatraz of Lighthouses" due to its remote location and difficult access. A glance at a road map of California gives a feeling for the topography of the Lost Coast. Highways hug the ocean for the entire length of our Pacific coastline -- except for the stretch where Highway 1 turns inland north of Fort Bragg. The road doesn't return to the sea for another 80 miles, west of Petrolia. That un-roaded stretch, where the King Range sweeps steeply thousands of feet down to the sea below, is the most rugged coastline in the contiguous U.S. No wonder early road builders gave up on it and built Highway 101 inland. At least nine ships were lost off Punta Gorda, at the north end of the Lost Coast, between the Lighthouse Board's original request for a light in 1888 and commissioning of the light in 1912. After the schooner Columbia was wrecked in 1907 with the loss of 87 lives, the request was honored and construction began in 1910. It was no mean task, given the remote location and rocky coastline. Materials were hauled to the beach from ships moored offshore on "high lines" before being dragged another half mile to "Windy Point." Three houses, together with several storage sheds and a workshop, comprised the little frontier settlement of Punta Gorda. Supplies were brought in on horseback from Petrolia, 11 miles away. In winter, washed out roads and high winds cut the outpost off for weeks at a time. Electricity for the light was supplied by a diesel generator -- power lines were never built. The light was decommisioned in February, 1951 after installation of a navigation buoy offshore. Twenty years later the Bureau of Land Management burned down the remaining buildings in response to squatters who had taken over the site. Today all that remains is the shell of the lighthouse, oil storage building, and concrete floors of the dwellings. 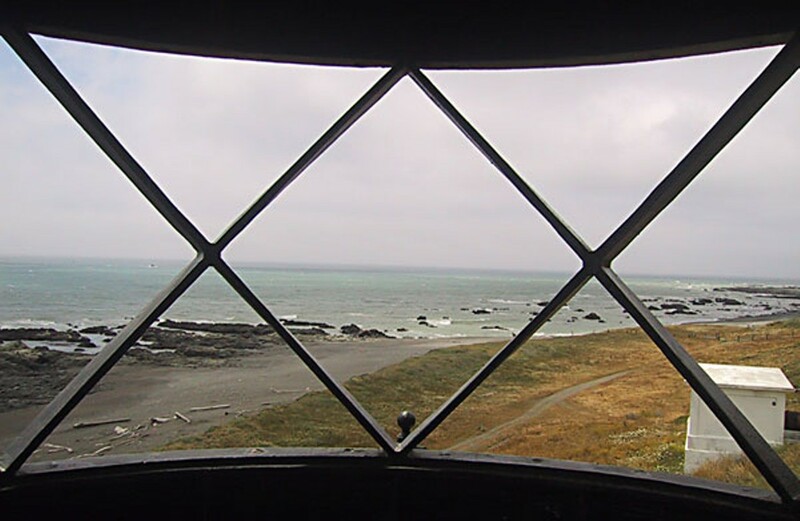 Even if you don't hike the entire Lost Coast, do walk down to the old lighthouse for a unique glimpse of California's maritime history. Don't forget your tide tables! Barry Evans (barryevans9@yahoo.com), thinks the Lost Coast is the most beautiful coastline in the world. He lives in Old Town Eureka. CAPTION 1: U.S. Coastguard photo of the Punta Gorda light in its heyday.